1: Unable to tick "apply" when ticking the additional scenery library boxes - can tick box but cant apply the settings. 2: Because of number 1, I cannot use or see any extra libraries other than default ones, even if the boxes are ticked. Any help would be appreciated please? What happens if you just click on the "OK" button? Nothing changes. I still see the same default libraries. I am at a loss to whats causing the issue. Its like it needs the apply button to be clicked before I see anything extra. I have installed it 3 or 4 times but no luck. I believe that I.S. 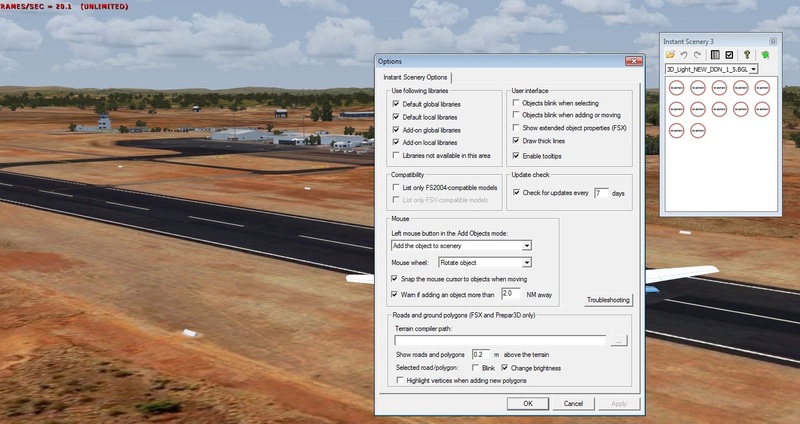 will only show you scenery libraries that have been installed and activated - manually - in your FSX Add On Scenery folder. They are all activated. I have manged to get it going. When I installed one of the A2A aircraft it buggered up the scenery...no idea why or how. This was the last item I installed before the scenery disappeared. What I did was install everything from the start, and set restore points after every 2 or 3 sceneries /aircraft until I found the culprit. It worked. I still havnt found out why it did what it did. Good to know you found the cause of the problem. Strange that an aircraft installer has that effect on your Addon Scenery, though! Maybe A2A installed a scenery file with a conflicting name? Or, maybe the installer just Saved instead of Updated?